Thanks to InternetServiceProviders.com for compiling this infographic with data that they compiled from: PewStates.org (the Pew Research Center is a subsidiary of this organization), PoetsAndQuants.com, NYTimes.com and NCES.ed.gov. Every month, users spend an average of 405 minutes on Facebook compared to 3 minutes on Google+. Each month, 40 more million women than men visit Twitter. On Facebook, 62% of the sharing is done by women. On Pinterest, 70% of the users are females. On Google+, 64% of the users are males. There are approximately 280 million active YouTube accounts with men spending an hour a week on YouTube (on average). Do any of these statistics surprise you? Which of the social media sites are you the most active on? Why do you feel that site is a good fit for you? My main goal for networking online is to build awareness and to cultivate mutually beneficial relationships. So, while I maintain an active presence on most of the major sites, I tend to use Twitter, Facebook, Google+ and Pinterest for sharing content while I spend the bulk of my time on LinkedIn. What are your thoughts? It is important to know where and how people spend their time on social networks. Thanks for the data. I use Twitter now. Why? For me it is easier to use (mostly text), less shining objects, less restrictions and more dynamic. Working with one social network is not easy at all. What can I say about working with two or more? I used Facebook and Pinterest for months and months. Now I’m more … cautious. It is better to choose only one network and use it as much as you can. In time you will be able to create automated systems that will take away most of the daily burden. You will be able to do what you really like and be creative. 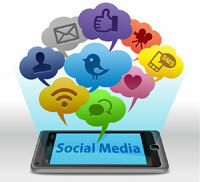 At that point you will also be able to work efficiently on 5-6 social networks or more. With no automated system in place working on a social network can be exhausting. Silviu recently posted..Social Media Automation Tools: Is Twitterfeed Good or Bad? I’m a big fan of Twitter too. One reason I really like it is that I can’t write lengthy mini-blog posts. It’s quick and effective. I’m also very active on LinkedIn because that site gives me the opportunity to build awareness and nurture mutually beneficial relationships. I’m at the point now where I have a system down and I spend a varying amount of time on different sites. There are some social networks that I visit multiple times a day and others that I visit weekly. My big push now is going to be to be more active on Google+ in light of Google’s focus on considering “authority” as a contributing factor of whether or not your content should be higher in the SERPs. Very interesting infographic and I agree with all of these. I have to admit I don’t even have a Google+ account. I’m not as active on Google+ as I should be but in light of what Matt Cutts said in a recent video, I’m making an effort to have more of a presence there. He mentioned that in Penguin 2.0 that there will be a focus on giving special ranking boosts based on “authoritative” sites. He hasn’t offered any specifics on how authority is determined but there’s speculation that participating on Google+ may have a positive impact. So, it may be time to consider creating that account soon. Nice post, thanks for sharing! Scheduled it for posting on my FB page some time tomorrow, too! I’m glad you liked it and thanks for sharing it. I need to make Google+ a habit. I plan on tweaking my social media strategy at the end of next month and that’s one of the changes that i intend to make. What a great post. It was informative, well written and the comments that followed also brought additional insight. I have to admit I have been neglectful of both my Twitter and Google accounts, which essentially means that without intending to I have created a gender bias. I’ll have to take some time and develop a strategy around using them more effectively. Thanks for letting me know that you liked my article. I enjoy infographics when they do a good job of communicating stats. I need to spen more time on Google myself. Twitter is already a habit for me. Thanks for joining us! Lorraine Marie Reguly recently posted..Need to Know About Self-Publishing? Melissa Bowersock Reveals All! Lorraine, I feel the same way that you do about infographics. When they’re done well, they’re both a nice break from a lot of text and yet it’s possible to derive a lot of information from them. I’d like to think I spend more than 3 minutes on G+. With G+ comments about, there’s less reason for me to be active on Facebook. When marketing via gender, it should also be remembered that women are tremendous influencers over the male customer. Just because there is a strong female presence you should still become part of that community – they often hold the purse strings. Not surprised to note how much time is spent on Facebook, but we should remember that it’s used by people from all walks of life, including an abundance of teenagers. Personally spend much more time on Linkedin than any other social media network. However, am deliberately starting to devote more time to Google Plus. Why? Because your involvement there has a huge impact on results on Google searches. It looks as if it’s the key to come up in high in search results. A group of marketing managers in Sweden that has an online network will now move it from Facebook due to new charges being implemented. Will be interesting to see what social media network will be chosen. Thanks for sharing your insight with us Catarina. I have been wanting to pay more attention to Google+ for a while and I honestly have not been able to find the time. I spend an inordinate amount of time on the LinkedIn BHB group. (Thanks to you and Jeannette for convincing me to implement some much needed rules.) Hopefully, between the rules and the possibility of another member helping me manage the group, I’ll be able to spend less time on LI and more on G+. I too believe that it has an impact on Google searches. What a fascinating graphic. I’d say my Twitter and G+ time is far greater than the average listed above. I would hope though that I’m not really spending that much time on Facebook… YIKES. I’ve been trying to spread my blog posts around a bit more, and have started using Reddit and Stumble Upon. I also just started a Tumblr account where I plan to share all my travel photos that can’t find a home in my author blog. These statistics are not only shocking but very surprising. Women tend to be very active on facebook, pinterest and twitter while men dominate in Google +, linkedin and youtube. I am forced to believe that women just use social media for linking with friends and fun while men …ok most men use it for business and corporate uses. This infographic is revealing very shocking details on twitter where by every month 40 million more women visit twitter than men! this is incredible.huh! You’re welcome. I’m glad you enjoyed it. I was surprised by the number of women on Twitter. If I had to guess, I think the ratio of males to females among my followers does not reflect that. Extremely informative. It looks like I’m spending too much time at the wrong sites. It can be very difficult to measure the results that you achieve from networking online. Referral traffic from a site is easy to measure but things like the benefits from forming mutually beneficial relationships are tough to measure. Having said that, if you have a clear vision of your target market, looking at stats like those in this infographic can provide you with insight. A.K.Andrew recently posted..1969: Does Music Capture the Heart of an Era? Very interesting and I was surprised at the stats. I really haven’t paid much attention to Facebook. I think for businesses LinkedIn has been more interactive. I really think so far as I can tell Google + has been a waste of time. The improvement in my opinion in SEO has been Linkedin. You have created a great blogging group and really appreciate you taking the time to care about others that can help each other out. That’s a great example Evan! Didn’t expect Facebook to be a man’s world. Pinterest was obvious to start with. This infographic is definitely something to ponder about! The stats on FB or Pinterest weren’t surprising at all The only one that I was really surprised by was Google+. I keep thinking that it’s going to catch on. Well, I think this gives us all a better idea of who we’re talking to on different social media channels. Of course, every community is different and it may be a mistake looking at nationwide averages. If I have mostly female connections on Google +, does it matter who their main audience is? I think the only time I would be interested in the demographics that one of my connections targeted would be if I were in a niche where that would make a difference. In general, I look at social networking sites to be similar to networking in person. The person who you’re interacting may not be your target customer at all but they could turn out to be an amazing source of referral traffic. That’s why it’s so important to always project ourselves in the way that we want to be perceived. Sometimes, I fear that some people don’t keep that in mind when they’re sharing personal information (and opinions) online. Very interesting to read those stats. I am hearing more and more people complain about Facebook (especially how it keeps changing) and thinking of heading to Google + – but if users spend an average 3 minutes there, it just isn’t worth many business’ time to make the switch. So I agree, Sherryl, that it’s something of a relief to not have to add another active platform to my weekly actions. I guess much of the rest of those stats go with the traditional model – women are more sharing and social while men are more information driven. Tash Hughes recently posted..Adding an online chat feature – good idea or not? I’m wondering if the stats for Google+ may be skewed because it is an average and a lot of the people who I follow there check in sporadically. Actually, I only drop in a few times a week myself but I do G+ blog posts quite a bit. So, maybe that counts. I really don’t know for sure. Lol. So many of these statistics apply to me. I watch YouTube every day, I prefer Google+ to any other social network. I have been on the network since its inception but have only recently started ‘socializing’. Funniest point was that 8/10 women say their Facebook friends annoy them. I wonder what the stats from men were. I imagine they were quite indifferent. LI is pretty much the only network I haven’t tried yet..I’d like to, but I can’t keep up with everything. I’ll stick with the ‘ghost town’. I like the communities – the active ones at least. I may be a little biased but I believe the Bloggers Helping Bloggers group on LI is a nice little community. If you do decide to network on LI, please connect with me and you may want to check out the group. A lot of the readers who comment here are members. I might do so and check out the group some time in the next couple days. I’ve stayed away from LI so far because, being a self employed blogger/affiliate marketer, I didn’t think there was much use for it. However, I’ve recently been hearing ‘this and that’ about Linked In around the blogosphere, plus this group you mentioned sounds like it would be more relevant to my business! This is exciting news! My blog demographic is mostly female, and my profession, doll design, is heavily female as well. I was worried that I was wasting time on twitter, but it looks like I’m not! Facebook is irritating me more than ever, so it’s funny to hear that I’m not the only one who feels that way. I go on it because I feel I have to, but I jump off as quickly as possible. Personally I think twitter is a lot more fun. Pinterest, LinkedIn and google plus are as expected. I’m only now looking at google plus a little bit. I don’t have time for another social network, and I’m just not sure how it fits in or what it offers that’s better than twitter, Facebook or LinkedIn. I do like google hangout though! I hop on and off Facebook myself and I don’t give my FB business page as much attention as a lot of business people do. What I do use FB for is to keep connected with friends and people who I have either worked with or connected with on a professional level in the past. My personal FB page is an eclectic mix of business and personal (not too personal) shares. It’s what I’m comfortable with. That’s good to know that you enjoy Google hangouts too. Sherryl — I, too, spend most of my time on LinkedIn among social media sites. My targets aren’t on Facebook by and large so simply going by statistics doesn’t matter. It’s all about individual preference. My blog is my principal business generater because it’s also my principal business, so that is where I devote my time. It’s my portfolio. This may sound radical, but I’m also finding that my personal business connections — actually interacting with other business people offline, a novel idea! — is where I am spending more time and should be spending more time. Networking offline isn’t radical at all. It’s a wonderful activity with it’s own rewards. I hope to get back into the swing of things myself. This time of the year there are lots of business expos to tap into. That always is a great opportunity to reconnect with people that I haven’t seen in a while as well as meet new people. Funny, I’ve been spending more time on Google+ because I have found some quite interesting people there. You can interact with smart people easily on Google+, if you find the active ones. I’ve learned a lot there; for example, yesterday I found some complaints about Yelp mistreating businesses and hiding good reviews. I tagged my restaurant owner client, and he said he didn’t find that, he was satisfied with Yelp. Today I learned that there is a security issue with some of the WP cache plugins. One of the ways I use Pinterest is I have a board of Photoshop and Illustrator tutorials. When I can squeeze in a bit of time, I really enjoy doing those. You’re one of the more active bloggers that I know on Google+. I’m sure that if I didn’t spend as much time on LinkedIn as I do (a good part of it managing the Bloggers Helping Bloggers group) that I would be more active on Google+. I just can’t manage to make the time for it. I could cut down on Twitter but that’s so quick and easy for me and by using BufferApp, I don’t really spend that much total time on it. Security issues with WP cache plugins? That’s news to me. I’ll have to search on it. Thanks for the heads-up! That is fascinating. Some of the number are’t a surprise but some are. I expected G+ to be a bit low because they are fairly new in the whole SM business, but they’re picking up steam. The number that I found really interesting was LinkedIn. With the ever-changing SM landscape, I expect this will have a very different look give a year. It would interesting to compare the two at that time, don’t you think? I would have liked to have seen more statistics on LinkedIn like how much of the total time that you spend on social media is spent on LinkedIn. Also, it would have been nice to know the percentage of people who used LI for business as opposed to personal or casual use. By far, I spend more time on LI than any other network but on Twitter (for example) I share much more content in a fraction of the time. I am a bit surprised. I would have expected to see higher numbers with Google+ The Pinterest numbers do not surprise me at all. The Google+ numbers don’t surprise me. A large number of those accounts were automatically created based on data from Google’s previous (failed) attempts to enter into the social media arena. They simply moved those accounts into their new Google+ platform. Some people have compared Google+ to a “ghost town” and in a sense it is. Except for a bunch of auto-fed feeds and SEOs spamming the place there’s not a lot of activity going on. When people do signup there, they usually don’t stick around for long. I continue to be surprised that more people don’t participate on Google+. Supposedly, it was supposed to help with SEO but I haven’t seen any real proof of that yet. I’m actually a little relieved that people are spending so little time on Google+. I keep chastising myself for not spending more time there but I have to be realistic about what’s the best use of my time. Honestly, most everything that I see shared there, I’ve already seen shared somewhere else.